Working with friends is always a treat, but it’s special honor in helping build a brand that is close to their heart. Holloway House is an event venue located in downtown OKC’s historic Film Row district with over 3,000 square foot loft space, expansive views of Downtown, and two massive sky lights. In its former life in the 1930s, Holloway House was home to hundreds of film reels as they waited to make their debut in theatres throughout the city. 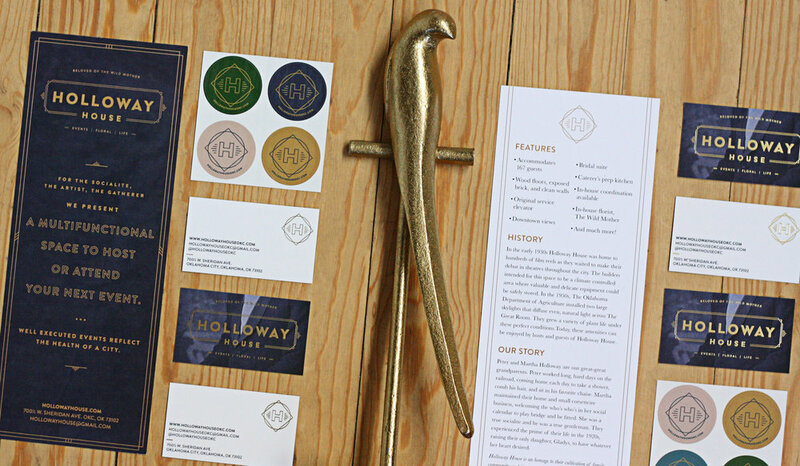 Wanting to honor its history and pay homage to the district, we worked together to create an identity system that would reflect the time period and be a dignified, mature message of warmth, hospitality and refuge.